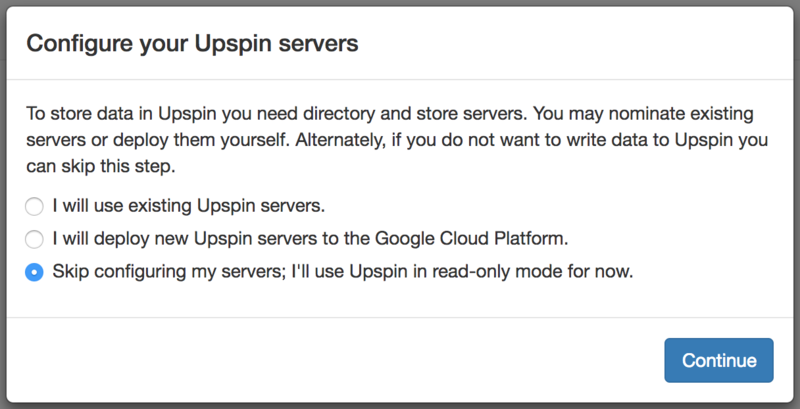 To access data within the Upspin world one does not require a directory or storage server. Think of yourself as a client, i.e., a user, that was granted access to another user’s data. Out of the box all commands should work on a , but there is no reason users can’t follow along. Download and extract the tools inside a directory listed in your system $PATH. E.g., I’ll create $HOME/upspin directory and add it to my $PATH. The files originate from the Download Upspin page. 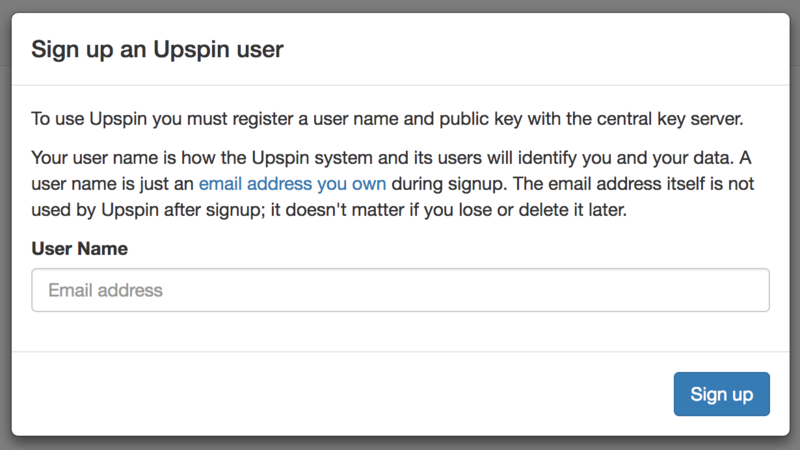 To create an Upspin user you’ll need a valid email address; think of this as a user name. The email address is used one-time to verify your identity. To reiterate, this email address will receive a total of ONE confirmation email. It cannot be used to recover your keys, and if someone hijacks your email they CANNOT gain access to your keys. As far as Upspin is concerned, once you click on the confirmation link you can abandon or delete your email account (not saying you should, just making a point). Your email address, i.e., user name, is how the Upspin world identifies you and your files. Lastly, the email address is permanently added to the keyserver log. I don’t think it’s a big deal, but this may be of importance to you. Write this down and store it in a secure, private place. 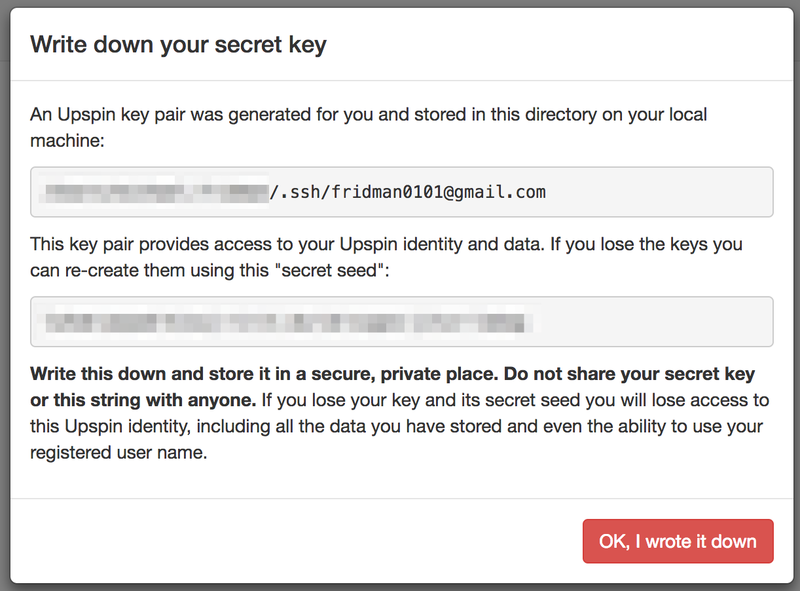 Do not share your secret key or this string with anyone. An account for “[email protected]” has been registered with the key server. Once you click Ok, I wrote it down you’ll be presented with an option to create servers, we’ll be skipping this step. Creating an Upspin server will be covered in a separate post. Quit out of the browser and ^C (Control-C) to stop upspin-ui. But what is an Upspin path? Example of an Upspin path: [email protected]/Public/mikes_fav_book.txt, don’t get hung up on the email address portion, just make a mental conversion between your email address and $HOME, so it feels like $HOME/Public/mikes_fav_book.txt within the Upspin world.